Collin Bogle has art running through his veins. His famous Father Lee Bogle's gorgeous artwork has stood the test of time, and Collin's will as well. Collin's mesmerizing wildlife artwork is strikingly realistic, and he has a very large national following. 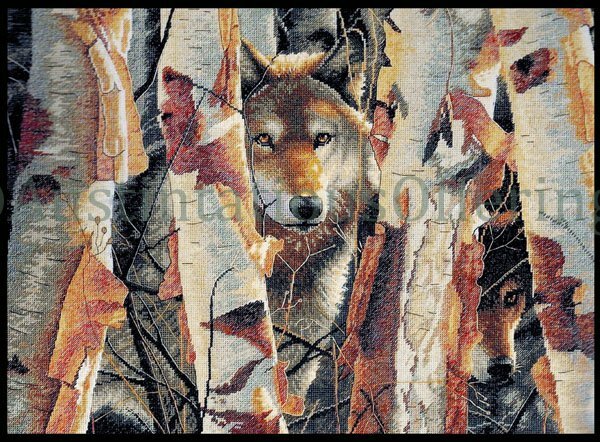 This exquisite artwork reproduction is from his original piece of Wolves in the Birch Forest, and is simply titled "The Guardian". You'll work both full and half cross stitches in this gorgeous piece for the counted cross stitch artist on 18 ivory Aida. Your finished piece will surely piece a work of art you'll enjoy for a lifetime!